Trastuzumab (anti-human HER2) is a humanized, recombinant monoclonal antibody that binds to the extracellular domain of HER2, MW:145.53 KD. 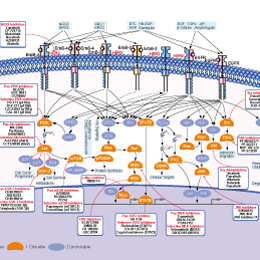 Pertuzumab (anti-HER2), a humanized monoclonal antibody and the first in the class of agents called the HER2 dimerization inhibitors, impairs the ability of HER2 to bind to other members of the HER family, MW: 148 KD. Combination of NVP-AEW541 and lapatinib cooperatively inhibits the growth of NVP-AEW541 resistant murine rhabdomyosarcoma primary cell cultures with Igf1r/Her2 complexes. Cell viability assay for Naïve, untreated (U20325; A) and NVP-AEW541 innately resistant mouse rhabdomyosarcoma primary culture (U44676; B) treated with varying concentrations of NVP-AEW541, lapatinib, or a combination of both. Naïve cells (U20325) were sensitive to NVP-AEW541, but lapatinib had no cooperativity. In contrast, NVP-AEW541 at moderate doses increased cell growth in resistant cell cultures (U44676). However, this paradoxical effect was reduced by the addition of lapatinib, although lapatinib treatment alone had very little effect. C, the NVP-AEW541 resistant primary tumor cell line (U44676) was treated with DMSO, 5 μmol/L lapatinib, 5 μmol/L NVP-AEW541, and a combination of 5 μmol/L NVP-AEW541+lapatinib for 25 minutes and Western blot analysis was done on lysates for p-Igf1r and p-Her2. Immunoblot analysis of serum starved H2030 cells pre-treated with 500 nM or 1 µM of gefitinib, crizotinib, CP-724714, or afatinib for 12 hr, followed by stimulation with EGF, HGF, NRG1, or their combination (50 ng/ml) for 10 min. Canertinib (CI-1033) is a pan-ErbB inhibitor for EGFR and ErbB2 with IC50 of 1.5 nM and 9.0 nM, no activity to PDGFR, FGFR, InsR, PKC, or CDK1/2/4. Phase 3. Sensitivity to the ErbB1/ErbB2 inhibitor lapatinib is highest for cancer cells from late-stage tumors in culture (mean ± SEM, p = 0.04 or 0.02 as indicated, Student’s t test; values represent the averages of four experiments, each done in triplicate with primary cells from independent mice). For MTT assays, cells (2,000 ~ 5,000 cells/well) were subcultured into 96-well plates according to their growth properties. Cell proliferation was assayed at 72 hr after treatment of CP-724714 by adding 20 μl of 5 mg/ml 3-(4,5-Dimethylthiazol-2-yl)-2,5-diphenyltetrazolium bromide (MTT) solution per 100 μl of growth medium. After incubating for 3-4 h at 37°C, the media were removed and 150 µl/well of MTT solvent (either absolute DMSO or isopropanol containing 4 μM HCl and 0.1% Nonidet-40) was added to dissolve the formazan. Western blot analysis confirm suppression of the biomarker p-EGFR upon treatment with EGFR TKIs in U-CH1 and UM-Chor1. Cells were serum-starved overnight before they were treated with a range of concentrations of the EGFR inhibitors for 4 h and then EGF-spiked (50 ng/ml) for 15 min. Endogenous controls (non-serum-starved, non-EGF-spiked), untreated controls (serum-starved, non-EGF-spiked) and vehicle controls (serum-starved, treated with 2.5% DMSO, EGF-spiked) were included. Phospho-EGFR was measured by western blot. (d,e) HL60 and NB4 cell flow cytometric cycle proportion assay. The cells were treated with the indicated concentrations of TAK165 for 3 days. (f) A western blot analysis of c-myc, p21 and p27 protein in HL60 and NB4 cells. The cells were treated with the indicated concentrations of TAK165 for 3 days. HER2-Inhibitor-1 is an analog of ARRY-380. ARRY-380 is a potent and selective HER2 inhibitor with IC50 of 8 nM, equipotent against truncated p95-HER2, 500-fold more selective for HER2 versus EGFR. confluent 10cm plates, 24hour FBS starvation, then treatment with compounds at 10nM for 30mins, followed by 5 minutes of 0.05ug/ml of EGF. Pellet was sonicated (setting 5, 5 seconds, twice), then quenched with 2XGSB. Loaded 10ul on AnyKD BioRad gel (20mins at 250V), transfered with BioRad Turbo system for 15 minutes (1.5A, 25V). Blocked with 5% milk for 1 hour at RT. Rocked overnight at 1:1000 in 5% BSA with primary Abs; Anti-rabbit secondary Ab at 1:2000 in 5% milk for 1 hour, developed with Thermo Femto Kit. TAK-285 is a novel dual HER2 and EGFR(HER1) inhibitor with IC50 of 17 nM and 23 nM, >10-fold selectivity for HER1/2 than HER4, less potent to MEK1/5, c-Met, Aurora B, Lck, CSK etc. Phase 1. ARRY-380 (ONT-380) is an oral, potent, selective, reversible and ATP-competitive small-molecule inhibitor of ErbB-2 (also called HER2) with IC50s of 8 nM and 7 nM for ErbB-2 and p95 HER2, respectively in cell-based assays, showing ~500-fold selective for HER2 vs EGFR. It has potential antineoplastic activity. (F) Stably transduced MCF10A cells were treated with the indicated drugs at 100 nM for 4 h in EGF- and serum-free media. Cell lysates were subjected to immunoblot analyses with the indicated antibodies.